Yamaha RX-A1060 review | What Hi-Fi? Getting an AV amp right at any price involves a careful balancing act, a trade-off between things that don’t always seem like they should go together. Power and subtlety; precision and excitement; features and transparency – often these complete opposites need to become enthusiastic bedfellows if an amp is going to perform to its best, especially when it costs over £1,000. After a few years of not quite finding that balance at this price, Yamaha has nailed it with the RX-A1060, a mid-range amp in the premium Aventage range. This means you can expect upgraded circuitry, better build quality and that anti-resonance fifth foot in the middle of the chassis to help reduce vibration. There is also a flap on its aluminium front panel to neatly cover up a decent number of front-mounted controls, giving it a slightly cleaner, more premium look to that of the plastic-fronted RX-V81 Series. It’s a 7.2ch amp, with support for Atmos 5.1.2 setups and DTS:X configurations for a more immersive listen. It’ll deliver a decently powerful 110W per channel too (8 Ohms, 2ch driven), with a back panel that will more than cater for the majority of systems. Expect eight HDMI ins, seven of which support HDCP2.2 for 4K playback, three each of coaxial and optical digital inputs, a USB port, 6.3mm headphone jack and more legacy connections than you’ll probably need. On the output side, two HDMI outs give you the option to set up a second zone should you wish. MORE: DTS:X – What is it? How can you get it? Of course wi-fi, AirPlay, DLNA and Bluetooth are on hand for the majority of your streaming needs (it supports 24-bit/192kHz FLAC, WAV and AIFF files plus both single and double speed DSD). Spotify Connect is also featured and services like Napster and Qobuz are available via the Yamaha control app. Yamaha’s own MusicCast multi-room system is also on board, which means you can share music with other Yamaha products throughout your home, or alternatively transmit via Bluetooth to a non-Yamaha wireless speaker. Set-up is nice and simple using the included YPAO microphone and auto-calibration setup. It’s one of the quickest and most accurate calibrations we know at this level, and after a few beeps and blips, it’s measured our room and adjusted our speakers accordingly. A quick check of the settings shows they look about right for our room, but it is always worth checking to be sure the calibration has judged your set-up correctly. We play Captain America: The Winter Soldier and skip to one of our favourite testing scenes in the movie – when a few of the Avengers come to face to face with The Winter Soldier himself. Yamaha is quick to show the big, bold character we’ve come to expect from its amps. It’s a powerful, scalable sound that fills our testing room without second thought, putting real force and authority around the scene’s big explosions, engine-revving car chases and erratic gunfire. It’s an exciting performance full of attack and drive, with effects pinged effortlessly – yet precisely – around you. It is immediately impressive on a first listen, but what’s great is the RX-A1060 is able to hold your attention after the initial big-sound thrill. There’s a great deal of subtlety to the sound that we missed on its predecessor. Voices are as expressive and nuanced as you’d want them to be, detail spills over across the frequency range and there’s real insight into soundtracks. This in turn helps it to deliver a dynamically strong performance, with its ability to build sound up as eloquently as it’s able to pull it back down again. This means it’s capable of doing the quiet parts of a soundtrack just as good as it does the loud exciting bits, which for a powerful amp like this, isn’t always the case. While its midrange and bass frequencies are superbly judged then, like last year’s RX-A1040, we do notice a touch of edge in the treble here. For this reason, you’ll want to pair this amp carefully – choose a speaker package that won’t emphasise its slightly bright, more aggressive performance and you’ll find it sits just on the right side of bright for the most part (though a shrill gunshot or big shattering of glass might still unsteady it). This brightness becomes more of an issue in stereo music listening, but we find switching to Yamaha’s Pure Direct mode helps soften those edges and tightens up the whole sound so it sounds more together. 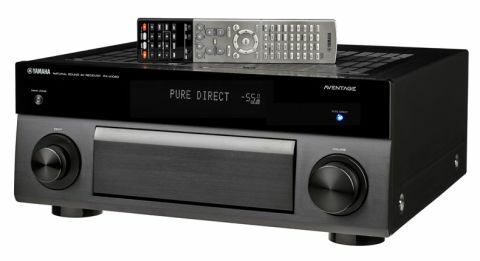 In this state, it’s musically pretty strong for an AV receiver, carrying over a great handling of dynamics and detail from its movie performance to put on a good show here too. It means it’s one of the most musical amps we’ve heard at this price – enthusiastic and punchy enough to get your toes tapping but with enough detail to keep us entertained. The only problem is that, like many AV receivers, it just struggles to compete with a stereo amp for out-and-out rhythmic timing. There’s no doubt the RX-A1060 is a return to form for Yamaha at this price. There’s still an edge to the treble that could do with some taming (or decent pairing) for real balance, but it’s managed to address most of the other issues we had with its predecessor. Overall, the A1060 is an amp that wears lots of hats and wears them all well. It’s certainly a worthy candidate for your audition list.